FORT MYERS, Fla. — Thousands of people will be going out to parties and bars to celebrate the New Year. As you enjoy the last day of 2018, make sure you’re being safe because AAA says this is one of the most dangerous holidays of the year. 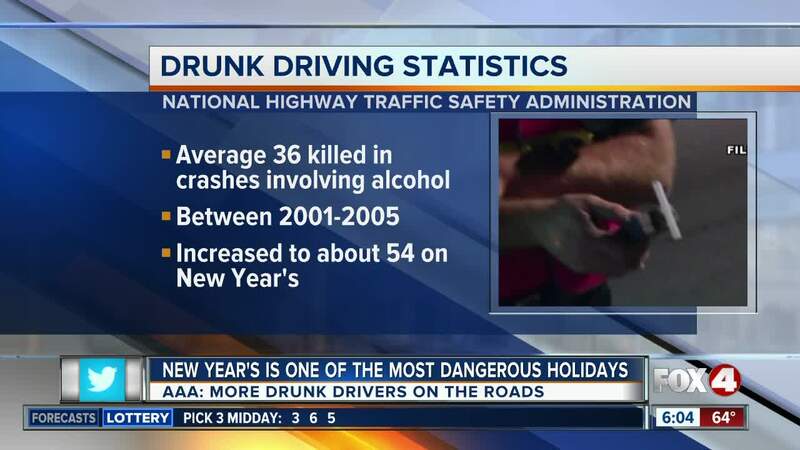 According to AAA , the odds of getting in a car accident on New Year’s Eve skyrockets because there are more drunk drivers on the road. During the holidays, more drivers are alcohol impaired because so many people are going to holiday parties. Across the country, 36 people, on average, were killed every day in crashes involving alcohol between 2001 and 2005. According to the National Highway Traffic Safety Administration , on New Year’s Day alone, that number went up an average of 54. AAA is sharing ways to get help you home safe. They say plan to have a designated driver before heading out for to celebrate. If you don't have one, call a ride-sharing service like Lyft or Uber or call a taxi.